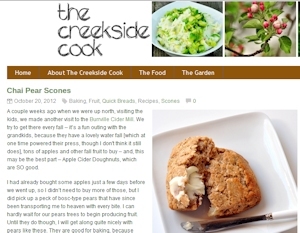 This entry was posted in Biscuits & Scones, Quick Breads, recipes and tagged baking, pears, scones. Bookmark the permalink. These scones look lovely! I love using spices in baking. I’ve never thought to use pears in scones before either, that’s an inspired combo, pears and chai. Emma – thanks so much and I agree, it is a great combination! Those sound very flavorful and delicate. I’m going to have to try them. What a nice combination of fruit and spices! They must have smelled so good coming out of the oven. Feast, Mireya and Jeanette – hope you guys all give them a try! These would be wonderful with my daily cup of tea. What a nice diversion from the usual scone flavors. I love chai spice with pear & in scones even better! Hi Dara, Maria and Marla – I have found that I love the flavors in chai with fruit – always so delicious! What a lovely combination of flavors. Definitely one for my must-try list. These look so good. I’ve never made scones because every recipe I come across calls for some fancy pan and well I’m not fancy lol. I may give these a try, love pear baked goods! Oh, these scones look fantastic. Funny, I had an idea to make pear ginger muffins, so I am definitely on your wavelength at the moment. Thanks Lana, Kate, Nichol and Carolyn – this is definitely a keeper recipe!